We’d love your help. 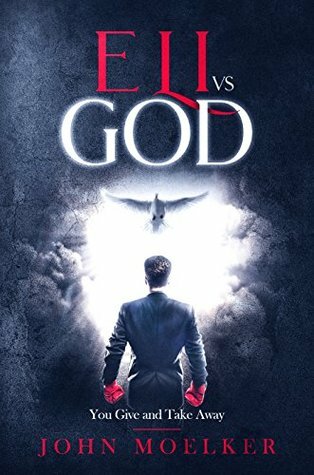 Let us know what’s wrong with this preview of Eli vs God by John Moelker. A twenty-two-year-old, frustrated Eli Poole is about to break free from a Christian home where he clearly doesn’t belong. He can imagine the freedom. Free at last! No more disapproving looks from his father. No more incessant attempts by his mother to evangelize her wayward son. No more clingy, snot-nosed little brother to put up with. In 3 days, Eli will finally escape Hi A twenty-two-year-old, frustrated Eli Poole is about to break free from a Christian home where he clearly doesn’t belong. He can imagine the freedom. Free at last! No more disapproving looks from his father. No more incessant attempts by his mother to evangelize her wayward son. No more clingy, snot-nosed little brother to put up with. In 3 days, Eli will finally escape Hicksville and enter a brave, new world, full of bright lights and great expectations. Eli’s journey will take him into a wilderness of trials and temptations and a valley that is deep, dark, and full of danger. But he might also meet some strange and interesting people along the way. Who knows? He might even find some romance—if his greatest adversary allows it, that is. Eli believes that it’s Eli vs. the world. He’s about to find out that it’s not the world he has to worry about—it’s the world’s creator—the LORD God, Almighty. Eli is in for the fight of his life. A fight to the death. Join Eli on his journey. You might just see a little bit of Eli in you. To ask other readers questions about Eli vs God, please sign up. This book was inspiring and real what we go through in every aspect of our lives, heart opener,tear breaker and joy. I just finished this great book written by John Moelker that tells of God's providence and grace. An especially wonderful book for a new or struggling Christian but it is easily relatable to any Christian in any stage of life. I found myself growing in spirit and knowledge as I read it. Thanks John! When I first chose this book, I thought it was going to something different like a pilgrim's progress type story. I was unable to stop reading as God spoke to my heart and all I could do was think of my family, my kids. I definitely want to share this book and I pray all who read it have an encounter with the loving God presented here. Great work writing this book!!!! Very touching book from first time author. Quick read and great presentation of the Gospel message. A page-turning coming of age tale that captures well the awkward parent-child dynamic many have faced. Set in Toronto, it has a modern, tech based Canadiana vibe that I found very appealing. The workplace romance had me needing to know the end. Highly recommended. This first-time author delivers an engaging read, with realistic dialogue, humour and a worthy message. I appreciated that the metaphor of combat continued in the story even after Eli becomes a true believer because it leaves space for real emotion besides just joy in the Christian life.